Music taste-sharing app Soundwave, which can perhaps best be described as a mobile-first alternative to Last.fm, is coming to the desktop today by way of a Chrome extension that allows you to share what you’re listening to in your browser. Once installed, the extension picks up the tracks you play via 11 Web-based music apps, including Rdio, Spotify, Deezer and Google Play Music, and posts them to your Soundwave account for others to see via the mobile app. To get started with the Chrome extension, you’ll need to update your Soundwave mobile app (on iOS or Android) to a new version that’s available from today. This will give you a seven-digit code to pair up your browser with your account. The updated mobile apps also now support tracking any music you play on SoundCloud and Pandora from your mobile device. Soundwave says that the expansion to the desktop follows research of the Irish startup’s user base. It seems a popular use case is to build up a personal music library in one place with which users can influence their friends’ tastes. 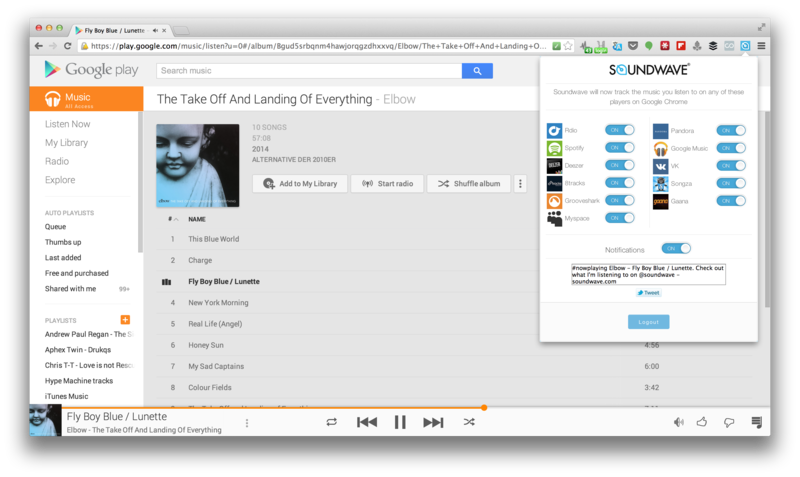 Desktop music listening allows them to share a far larger chunk of their overall listening habits. Indeed, I’ve been using the new extension for a few days and my Soundwave profile has got a lot busier as a result.